Clipper is the all-in-one transit card for the Bay Area. The easy-to-use, reloadable Clipper transit fare card can hold transit passes, cash value, parking value or any combination thereof. Monthly passes or cash value can be loaded on a Clipper Card which is accepted by all Bay Area public transit agencies (i.e, AC Transit, BART, Caltrain County Connection, FAST Golden Gate Transit & Ferry Marin Transit, Muni Petaluma Transit, SamTrans Santa Rosa CityBus, SF Bay Ferry, SolTrans Sonoma County Transit The VINE, Tri Delta Transit Vacaville City Coach, VTA WestCAT and Wheels. Using your Clipper card is as easy as tapping the card on the card reader as you step into the vehicle. You will hear a loud beep once to register your payment and the balance remaining on your card will be shown on the reader. When using a Clipper Card on cable cars, a conductor will tag your card on a hand-held Clipper reader. 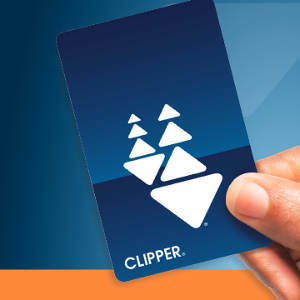 You can order an adult Clipper Card online or by phone at 877-878-8883 (TDD/TTY 711 or 800-735-2929 and type "Clipper"). Allow up to 10 days for delivery. Note: Adult Clipper cards cost $3. Clipper waives this fee if you set up Autoload when you order your card online. If you buy a card at a Muni Metro or Golden Gate Ferry ticket machine, you must add a minimum value to your card. You must have a minimum balance of $1.75 for adult Clipper cards and $1 for Youth, Senior and RTC Clipper cards if you are paying for your ride with cash value. Clipper automatically calculates free transfers on Muni buses, light-rail vehicles and historic streetcars. You must tag your card each time you transfer, so the card reader can confirm the 90-minute transfer period is still in effect. The card reader will display the remaining transfer time that you have left on your card. When you transfer from BART to Muni within an hour using your adult Clipper card, you will automatically receive a 50-cent discount. Muni Visitor Passport gives you unlimited rides on Muni, Muni Metro light rail, historic streetcars, and cable cars for 1, 3 or 7 consecutive days. A new adult Clipper card costs $3. Clipper will waive the fee if you order your card online and sign up for Autoload. Clipper offers discounts for youths, seniors and customers with disabilities. For more information on how to obtain these discounts, select from the list below. Seniors (age 65 and over) and people with disabilities are eligible to pay the discounted cash fare to ride Muni. On buses, streetcars and light rail vehicles operating on the surface, you must show a valid ID to pay a discount cash fare. On the Muni Metro underground, you must purchase a reloadable discount ticket from a ticket vending machine to enter the system through fare gates or via the elevator.